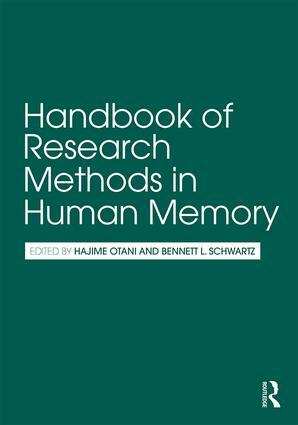 The Handbook of Research Methods in Human Memory presents a collection of chapters on methodology used by researchers in investigating human memory. Understanding the basic cognitive function of human memory is critical in a wide variety of fields, such as clinical psychology, developmental psychology, education, neuroscience, and gerontology, and studying memory has become particularly urgent in recent years due to the prominence of a number of neurodegenerative diseases, such as Alzheimer’s. However, choosing the most appropriate method of research is a daunting task for most scholars. This book explores the methods that are currently available in various areas of human memory research and serves as a reference manual to help guide readers’ own research. Each chapter is written by prominent researchers and features cutting-edge research on human memory and cognition, with topics ranging from basic memory processes to cognitive neuroscience to further applications. The focus here is not on the "what," but the "how"—how research is best conducted on human memory. Hajime Otani is a professor of psychology at Central Michigan University. His current research focuses on emotion and memory. Bennett L. Schwartz is a professor of psychology at Florida International University. He conducts research on memory and metamemory. He is currently Editor-in-Chief of New Ideas in Psychology.